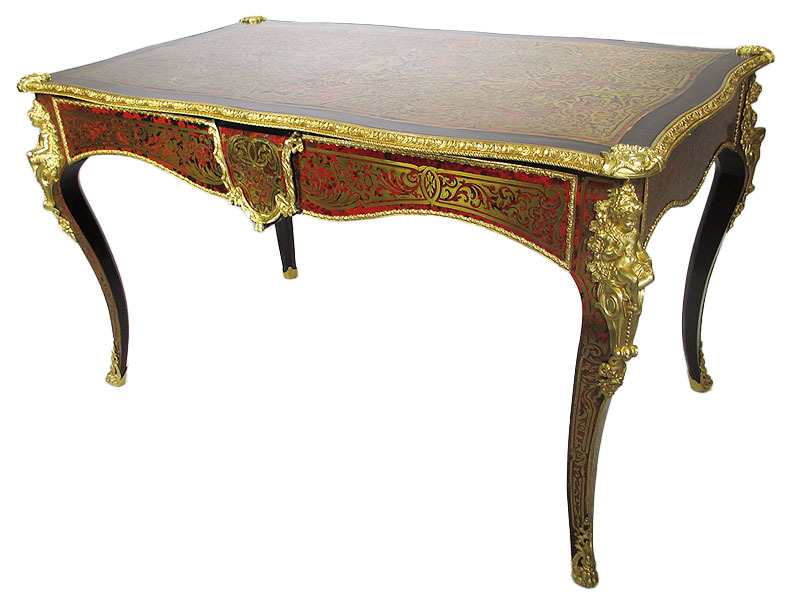 A Fine French Napoleon III Gilt-Bronze Mounted, Ebonized and Cut-Brass Inlaid Tortoiseshell Writing Table - Center Table - Desk with a single drawer, in the Manner of André Charles Boulle (French, 1642-1732). The rectangular top with an ornate Boulle style design, centered with a standing maiden amongst flowers and wreaths, above a lambrequin centered frieze flanked to the front by a sprung drawer, on cabriole legs headed by allegorical figures of seated putti with flowers running to scroll feet Circa: 1860-70. 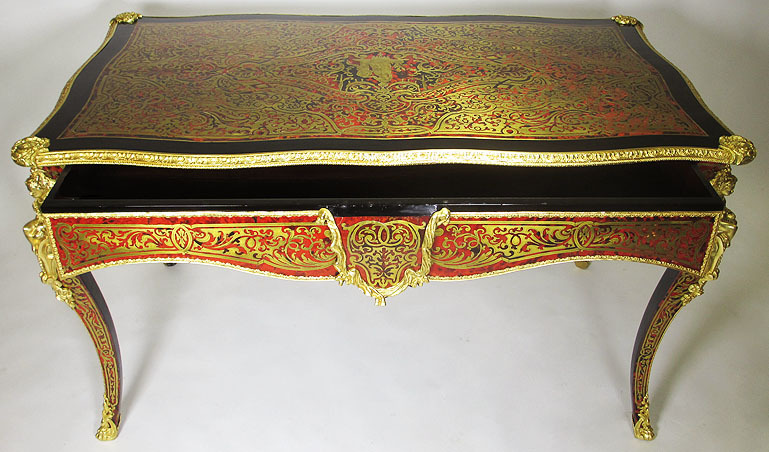 André Charles Boulle (1642-1732) French cabinetmaker, who gave his name to a fashion of inlaying known as Boulle or Buhl work. The son of Jean Boulle, a member of a family of ebenistes who had already achieved distinction - Pierre Boulle, who died c. 1636, was for many years tourneur et menuisier du roy des cabinets d'ebene, - he became the most famous of his name and was, indeed, the second cabinet-maker - the first was Jean Mace - who has acquired individual renown. That must have begun at a comparatively early age, for at thirty he had already been granted one of those lodgings in the galleries of the Louvre which had been set apart by Henry IV. for the use of the most talented of the artists employed by the crown. To be admitted to these galleries was not only to receive a signal mark of royal favour, but to enjoy the important privilege of freedom from the trammels of the trade gilds. Boulle was given the deceased Jean Mace's own lodging in 1672 by Louis XIV. upon the recommendation of Colbert, who described him as "le plus habile ebeniste de Paris," but in the patent conferring this privilege he is described also as "chaser, gilder and maker of marqueterie." Boulle appears to have been originally a painter, since the first payment to him by the crown of which there is any record (1669) specifies "ouvrages de peinture." He was employed for many years at Versailles, where the mirrored walls, the floors of "wood mosaic," the inlaid panelling and the pieces in marqueterie in the Cabinet du Dauphin were regarded as his most remarkable work. 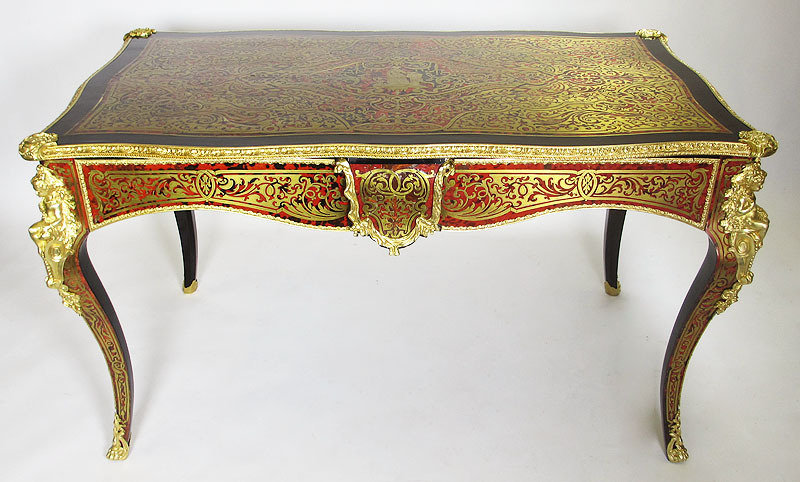 A Fine French Napoleon III Gilt-Bronze Mounted, Ebonized and Cut-Brass Inlaid Tortoiseshell Writing Table - Center Table - Desk with a single drawer, in the Manner of André Charles Boulle (French, 1642-1732). The rectangular top with an ornate Boulle style design, centered with a standing maiden amongst flowers and wreaths, above a lambrequin centered frieze flanked to the front by a sprung drawer, on cabriole legs headed by allegorical figures of seated putti with flowers running to scroll feet Circa: 1860-70. 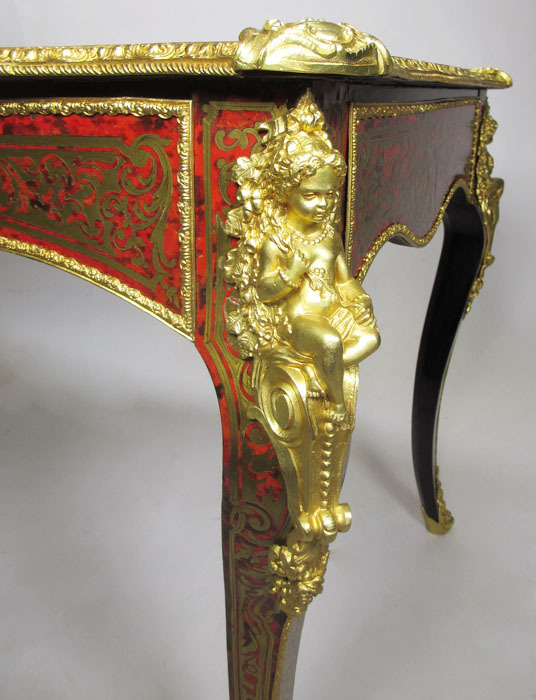 French cabinetmaker, who gave his name to a fashion of inlaying known as Boulle or Buhl work. The son of Jean Boulle, a member of a family of ebenistes who had already achieved distinction - Pierre Boulle, who died c. 1636, was for many years tourneur et menuisier du roy des cabinets d'ebene, - he became the most famous of his name and was, indeed, the second cabinet-maker - the first was Jean Mace - who has acquired individual renown. That must have begun at a comparatively early age, for at thirty he had already been granted one of those lodgings in the galleries of the Louvre which had been set apart by Henry IV. for the use of the most talented of the artists employed by the crown. To be admitted to these galleries was not only to receive a signal mark of royal favour, but to enjoy the important privilege of freedom from the trammels of the trade gilds. 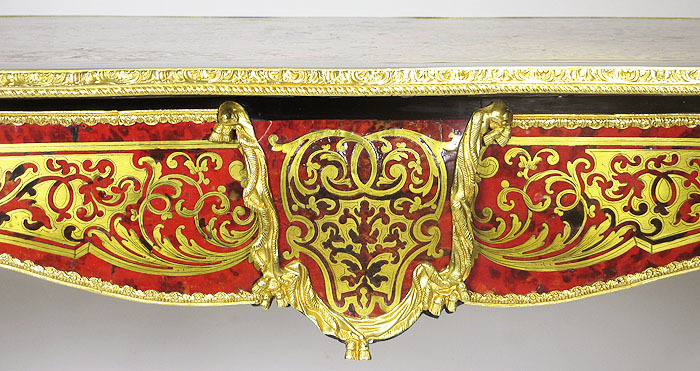 Boulle was given the deceased Jean Mace's own lodging in 1672 by Louis XIV. upon the recommendation of Colbert, who described him as "le plus habile ebeniste de Paris," but in the patent conferring this privilege he is described also as "chaser, gilder and maker of marqueterie." Boulle appears to have been originally a painter, since the first payment to him by the crown of which there is any record (1669) specifies "ouvrages de peinture." He was employed for many years at Versailles, where the mirrored walls, the floors of "wood mosaic," the inlaid panelling and the pieces in marqueterie in the Cabinet du Dauphin were regarded as his most remarkable work. These rooms were long since dismantled and their contents dispersed, but Boulle's drawings for the work are in the Musee des Arts Decoratifs. His royal commissions were, indeed, innumerable, as we learn both from the Comptes des bftiments and from the correspondence of Louvois. Not only the most magnificent of French monarchs, but foreign princes and the great nobles and financiers of his own country crowded him with commissions, and the mot of the abbe de Marolles, "Boulle y tourne en ovate," has become a stock quotation in the literature of French cabinet-making. Yet despite his distinction, the facility with which he worked, the high prices he obtained, and his workshops full of clever craftsmen, Boulle appears to have been constantly short of money. He did not always pay his workmen, clients who had made considerable advances failed to obtain the fine things they had ordered, more than one application was made for permission to arrest him for debt under orders of the courts within the asylum of the Louvre, and in 1704 we find the king giving him six months' protection from his creditors on condition that he used the time to regulate his affairs or "ce sera la derniere grace que sa majeste lui fera la-dessus." Twenty years later one of his sons was arrested at Fontainebleau and kept in prison for debt until the king had him released. In 1720 his finances were still further embarrassed by a fire which, beginning in another atelier, extended to his twenty workshops and destroyed most of the seasoned materials, appliances, models and finished work of which they were full. The salvage was sold and a petition for pecuniary help was sent to the regent, the result of which does not appear. It would seem that Boulle was never a good man of business, but, according to his friend Mariette, many of his pecuniary difficulties were caused by his passion for collecting pictures, engravings and other objects of art - the inventory of his losses in the fire, which exceeded £ 4 o,000 in amount, enumerates many old masters, including forty-eight drawings by Raphael and the manuscript journal kept by Rubens in Italy. He attended every sale of drawings and engravings, borrowed at high interest to pay for his purchases, and when the next sale took place, fresh expedients were devised for obtaining more money. Collecting was to Boulle a mania of which, says his friend, was impossible to cure him. Thus he died in 1732, full of fame, years and debts. He left four sons who followed in his footsteps in more senses than one - Jean Philippe (born before 16 9 o, dead before 1745), Pierre Benoit (d. 1741), Charles Andre (1685-1749) and Charles Joseph (1688-1754). Their affairs were embarrassed throughout their lives, and the three last are known to have died in debt. All greatness is the product of its opportunities, and the elder Boulle was made by the happy circumstances of his time. He was born into a France which was just entering upon the most brilliant period of sumptuary magnificence which any nation has known in modern times. Louis XIV., so avid of the delights of the eye, by the reckless extravagance of his example turned the thoughts of his courtiers to domestic splendours which had hitherto been rare. The spacious palaces which arose in his time needed rich embellishment, and Boulle, who had not only inherited the rather flamboyant Italian traditions of the late Renaissance, but had t benisterie in his blood, arose, as some such man invariably does. arise, to gratify tastes in which personal pride and love of art were not unequally intermingled. 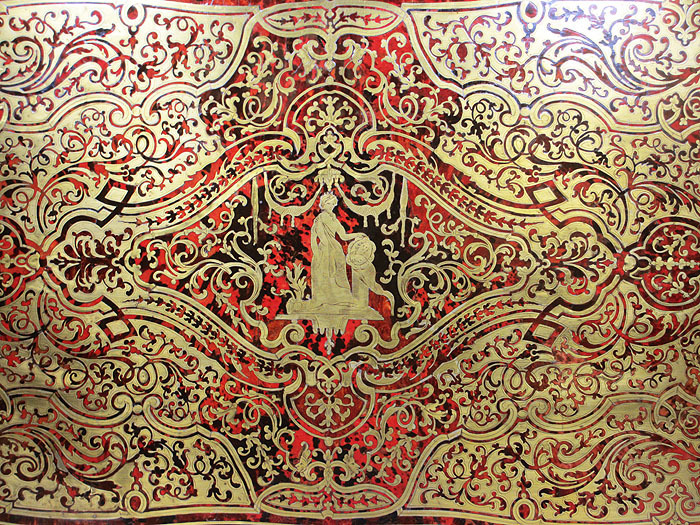 He was by no means the first Frenchman to practise the delightful art of marqueterie, nor was he quite the inventor of the peculiar type of inlay which is chiefly associated with his name; but no artist, before or since, has used these motives with such astonishing skill, courage and surety. He produced pieces of monumental solidity blazing with harmonious colour, or gleaming with the sober and dignified reticence of ebony, ivory and white metal. The Renaissance artists chiefly employed wood in making furniture, ornamenting it with gilding and painting, and inlaying it with agate, cornelian, lapis-lazuli, marble of various tints, ivory, tortoise-shell, mother-of-pearl and various woods. Boulle improved upon this by inlaying brass devices into wood or tortoise-shell, which last he greatly used according to the design he had immediately in view, whether flowers, scenes, scrolls, &c.; to these he sometimes added enamelled metal. 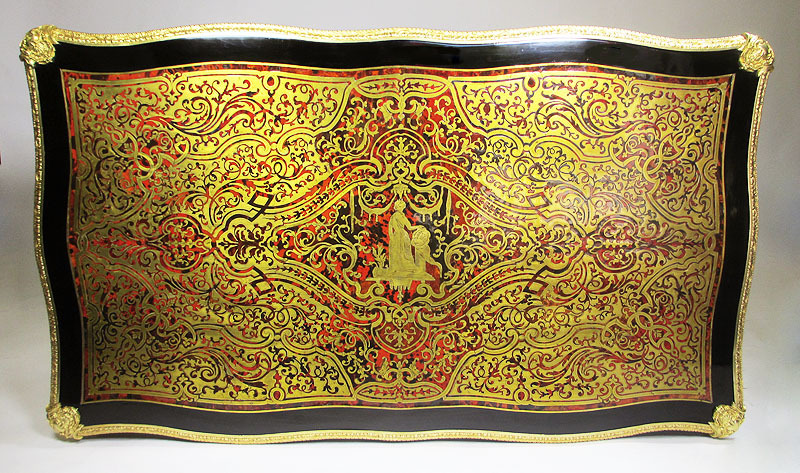 Indeed the use of tortoise-shell became so characteristic that any furniture, however cheap and common, which has a reddish fond that might by the ignorant be mistaken for inlay, is now described as "Buhl" - the name is the invention of the British auctioneer and furniture-maker. In this process the brass is thin, and, like the ornamental wood or tortoise-shell, forms a veneer. In the first instance the production of his work was costly, owing to the quantity of valuable material that was cut away and wasted, and, in addition, the labour lost in separately cutting for each article or copy of a pattern. By a subsequent improvement Boulle effected an economy by gluing together various sheets of material and sawing through the whole, so that an equal number of figures and matrices were produced at one operation. Boulle adopted from time to time various plans for the improvement of his designs. He placed gold-leaf or other suitable material under the tortoise-shell to produce such effect as he required; he chased the brass-work with a graver for a like purpose, and, when the metal required to be fastened down with brass pins or nails, these were hammered flat and disguised by ornamental chasing. He also adopted, in relief or in the round, brass feet, brackets, edgings, and other ornaments of appropriate design, partly to protect the corners and edges of his work, and partly for decoration. He subsequently used other brass mountings, such as claw-feet to pedestals, or figures in high or low relief, according to the effect he desired to produce. 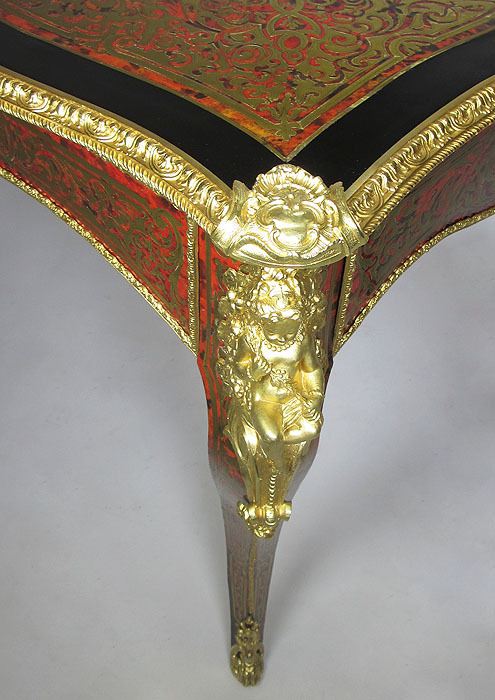 These mounts in the pieces that undoubtedly come from Boulle's atelier are nearly always of the greatest excellence. They were cast in the rough - the tools of the chaser gave them their sharpness, their minute finish, their jewel-like smoothness.